Forget about carpeting, RUGS are expensive and they’re just like a tiny little part of carpet! Alright – sure they’re special and such and maybe that accounts for the cost as compared to a basic one-color carpet, but man! They’re expensive! And yet…so cute and so ‘pulls-the-room-together’ which means, I am on the hunt for one. Specifically for my bedroom. I’ve had one in my bedroom which was my Aunt’s (she’s a cool one, the kind you always wanted to babysit you) but I can only have one thing for so long before I get physically sick of it. I get dejected to the point where I call up Elizabeth and tell her that I need a rug so badly, and if I did vomit on my current rug it would only be an improvement. Dramatic, yes. Oh, Anthropologie, you have such wonderful quirky-meets-modern things. 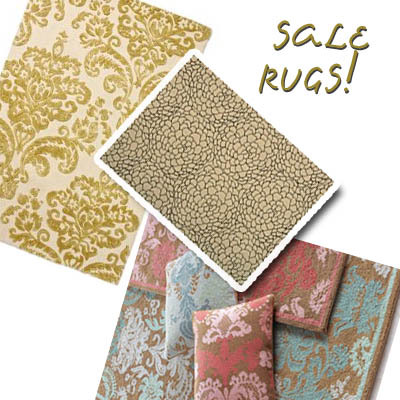 I am very much loving the Wallpaper Rug (SALE – $49.95-$149.95). See all of the rugs on sale at Anthropologie here. The simplicity within everything Calvin Klein is manifested in the Calvin Klein Camilla Ivory Area Rug from (SALE – $139.99 – $2,919.00) Macy’s. Neiman Marcus has a small but adorably pastel, Parisian-esque Damask rug in blush (SALE $135.00). I think this would be perfect in front of my vanity table. HEY! Where can I find that Wallpaper rug by Anthropologie??? I’ve looked EVERYWHERE. LOVE IT. Any help appreciated.